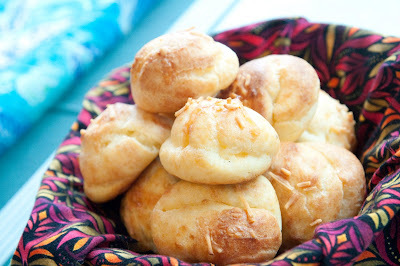 One of our favorite appetizers are these delightfully light cheesy dough poofs. This savory cousin of the cream puff is surprisingly easy to make and a great accompaniment to cocktails or meals. Preheat oven to 425 degrees. In a medium saucepan, stir together over medium heat milk, butter, salt and pepper until just before the milk boils. Dump the flour into the mixture and mix vigorously with a wooden spoon until it comes together. Cook on low heat for two minutes while stirring. The mixture will form into a ball and come away from the sides of the pan. 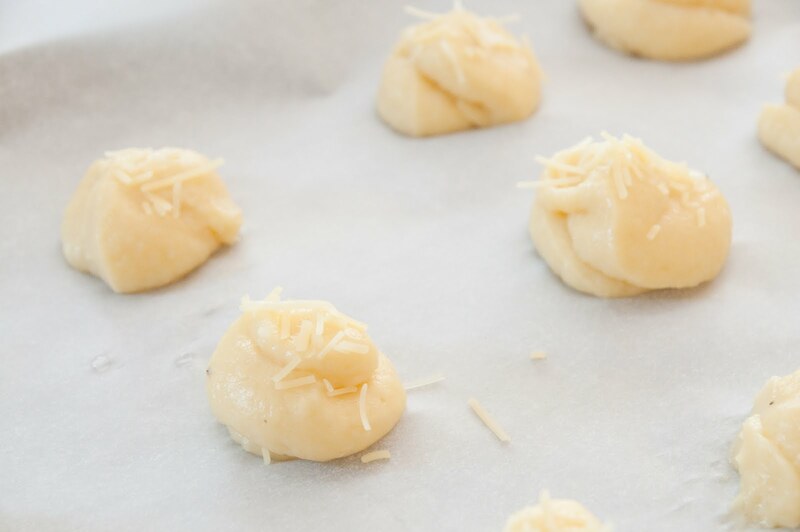 Put the hot dough in a food processor and pulse in 4 eggs and grated gruyere and parmesan cheese until incorporated and dough is thick and smooth. Put the dough into a pastry bag or plastic bag with a corner cut off, and pipe onto a parchment lined baking sheet. We like our poofs about 1 inch in diameter. Use a wet finger to round out the tops. Brush tops with an egg wash and sprinkle grated cheese on top. This entry was posted in appetizers, cheese, french by Princess Risa. Bookmark the permalink.